For the past two weeks my television keeps losing the signal and pixelating . I now can only watch it through my DVD player. We have had the arial tested which is fine, the funny thing is that a television in another room is ok. Please help as this is driving us potty. Just turned my other television on in the other room and that is now losing the signal. What can we do as I posted in my other question there is not a problem with my arial? Anne : when your aerial man came out what did he say could be the problem. Anne: Just out of interest where is your aerial installed? 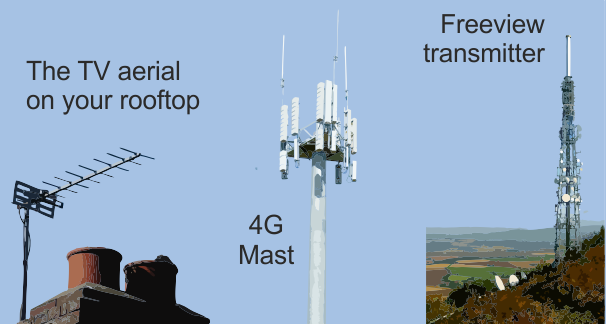 because indications are that you are located at only 8 miles away from the Emley Moor transmitter and as such (in theory anyway) should be getting blasted with a signal from there, if you have a set top aerial kicking around try a test using that. Dave Lindsay (4.2.2013). Thank you, but that is disappointing news. I am aware that some channels which are available via FREEVIEW - and which I like to watch - are not available on the FREESAT service. I can only hope that my Freeview reception from the WINTER HILL transmitter is NOT disrupted by the introduction of 4G. I live in the waltham area I have often noted that at dawn the very low power on some channels suddenly returns to normal. I have a calibrated spectum anylyzer and have " caught them at it" despite total denails from Waltam etc. I have also noted some very high power carrier signals being transmitted mainly around the old analogue c38 which was/is used to link old tv's and old vcr's and is still used by many elderly people who can not afford to purchase modern equipment. Who is going to pay for filters to be fitted for the elderly and non technical customers? How long will many people be without a full tv service before filters (if they work ) to be suplied and fitted.? Waltham transmitter staff come clean and admit that you have many problems now and expect very many more when 4 g arrives. Mr P Watmough: C38 is now allocated to special events usage, to replace C69 which has been withdrawn for 4G use. I said this on the other 4G thread, but Briantist redirected me here. Even if a 4G signal in the channel 61-68 range, and the TV transmitter you pick up from uses channels 52-60, surely 4G signals will be a totally different format to Freeview (DVB 8K) signals. In which case, wouldn't Freeview TVs and boxes automatically distinguish 4G signals from Freeview signals (and simply ignore 4G signals) by the difference in format? If not, please explain. 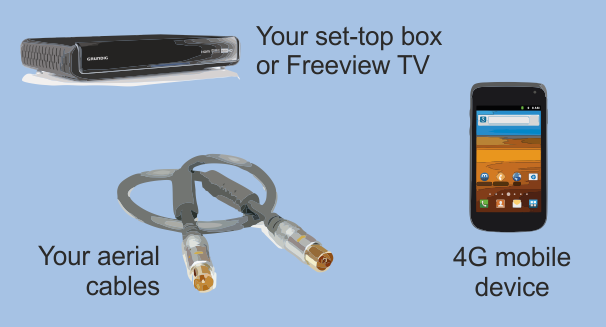 A freeview tuner will see the 4g signal as noise. If the 4g signal is strong enough it will flood the tuner with noise and make it so it cannot decode the freeview signal. The tuners in TV's are made to tune up to UHF68 and so will definitely see the 4g signals. There is talk of manufacturing newer aerials that are made so that they only pick up, upto UHF60. And over a time I guess that the software in TV's and freeview boxes will also change.